A seminar to study Iranian handicrafts was held in the Italian city of Milan with the aim of introducing Iran’s ancient heritage to the world. The seminar, which was attended by a number of Iranian and Italian officials and artists including the deputy head of Iran’s Cultural Heritage, Handicrafts and Tourism Organization (ICHTO), was opened with a message by Iranian Vice-President and ICHTO Chief Ali-Asghar Mounesan. In his message to the seminar, Mounesan said the Islamic Republic of Iran has always been seeking to establish bilateral cultural ties with other countries with the aim of promoting culture and knowledge across the world. “With its thousand-year history, Iran is viewed as one of the pioneering countries in cultural and art fields across the globe. The country has already created over 358,000 jobs in handicrafts industry by offering over 250 types of handicrafts,” the message added. He also invited artists from Italy and other countries taking part in the seminar to visit Iranian historical cities like Isfahan, Shiraz and Yazd and participate in Tehran’s International Handicraft Exhibition which is held annually with the presence of over 400 artists from Iran and abroad. The Iranian official then outlined the events to be held in future with the aim of expanding bilateral relations between Iran and Italy in cultural and art fields. 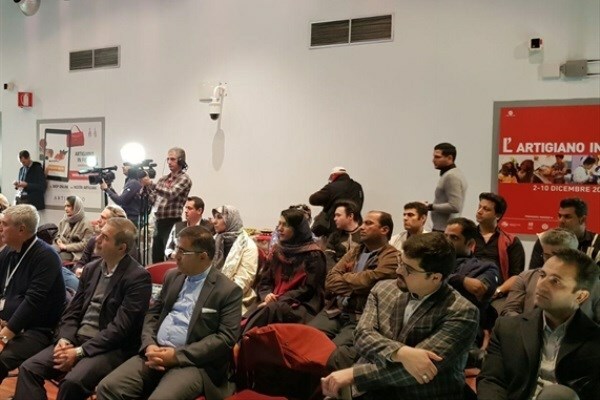 During the seminar, the participants got familiar with Iran’s capacities in the field of handicrafts as well as parts of its tourist attractions and cultural heritage, a Farsi report by the Public Relations Department of ICHTO said on Saturday. In an address to the seminar, ICHTO Deputy Head Bahman Namvar Motlaq elaborated on the Iranian artists and craftsmen’s capacities. For his part, former Italian ambassador to Iran took the podium and called for expansion of bilateral ties between Iran and Italy in art fields. During the seminar, woodcarving, needlework, leatherwork productions along with glassware, traditional jewelleries, miniatures, ceramics, potteries, precious stones and semi-precious gemstone plus various types of Persian rugs were put on display.